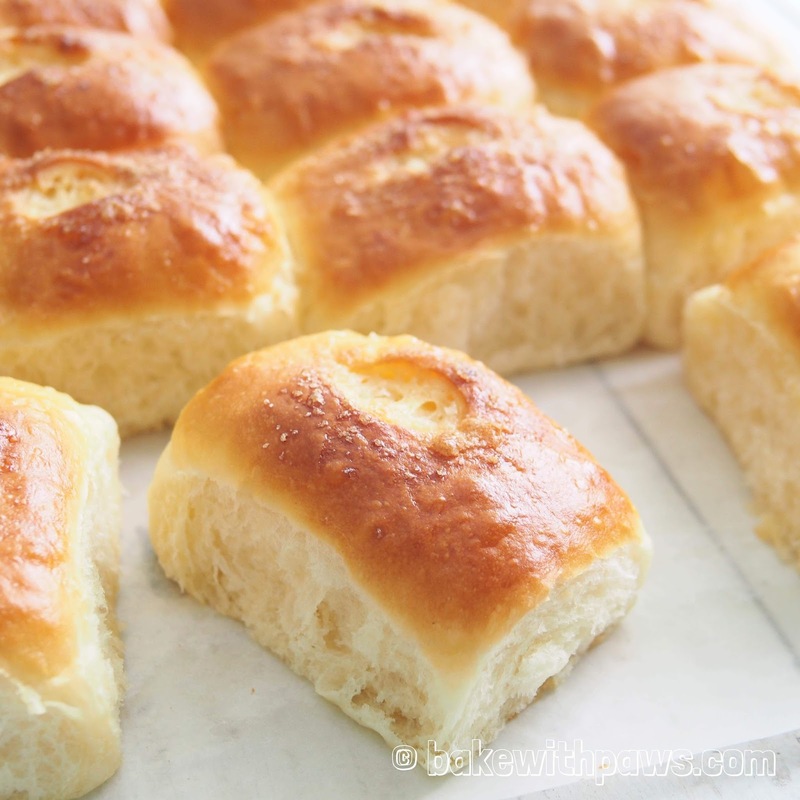 The “Tangzhong” method is tried and true and will always yield a soft, moist and elastic bread texture. 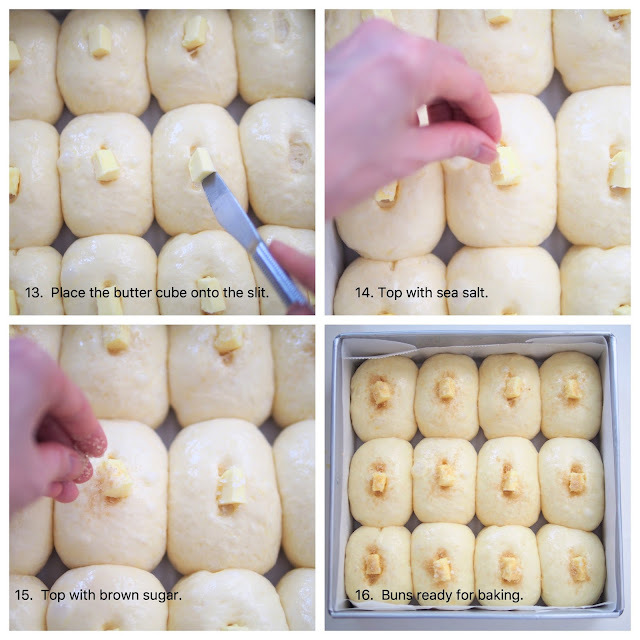 The buns will still stay moist even after few days! 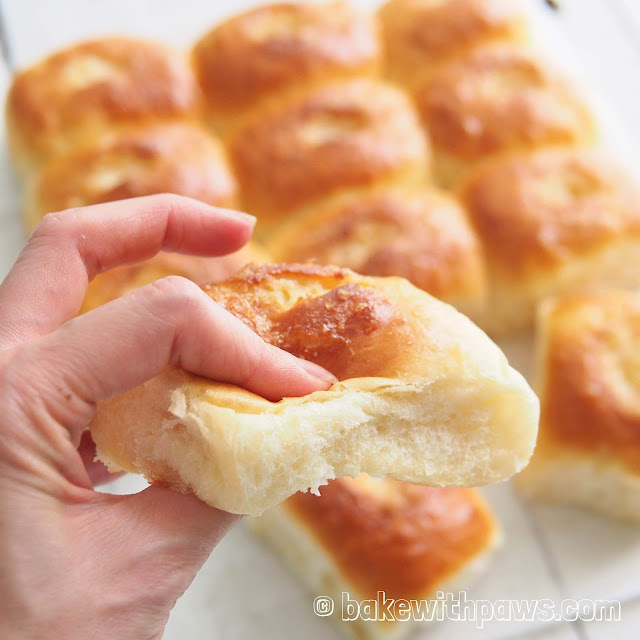 I added more Tangzhong this time and the bread is even softer and I think that the texture works very well for a sweet bread like these Butter Sugar Buns. Add all ingredients (start with salt, flour, yeast, sugar, milk powder, butter, egg, fresh milk and lastly tangzhong) into the bowl of stand mixer. Using the dough hook, knead until the dough comes together and is beginning to become elastic and tacky but not sticky. Tacky dough behaves sort of like a Post-it note, sticking to a surface but peeling off easily. It takes around 10 to 15 minutes. If the dough is too dry, add 1 tablespoon of milk at a time. Punch down the dough to release the air. 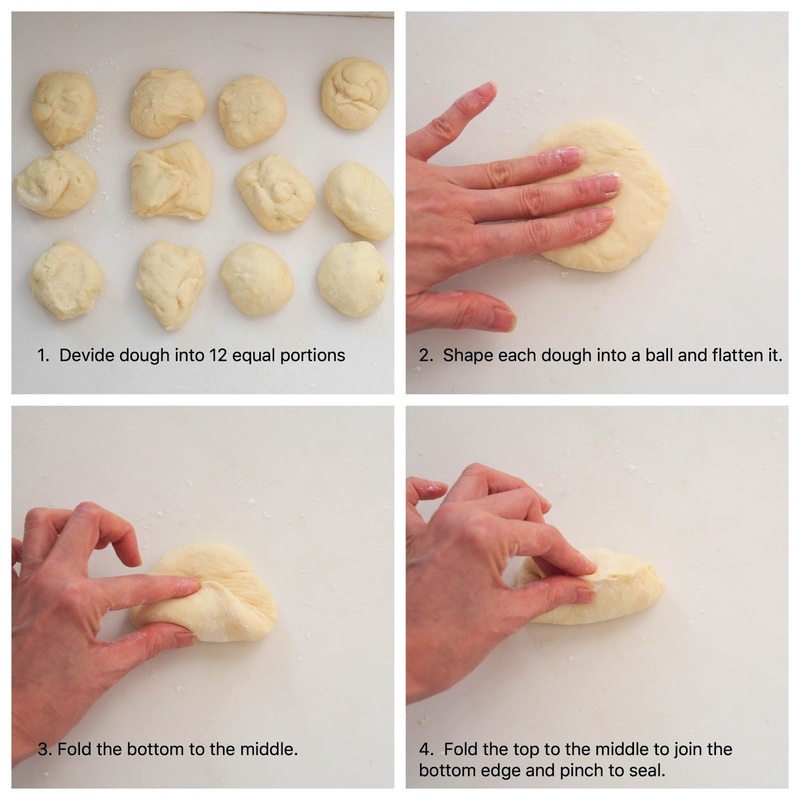 Transfer the dough to a clean floured surface then divide into 12 equal portions. Shape each dough into a ball. 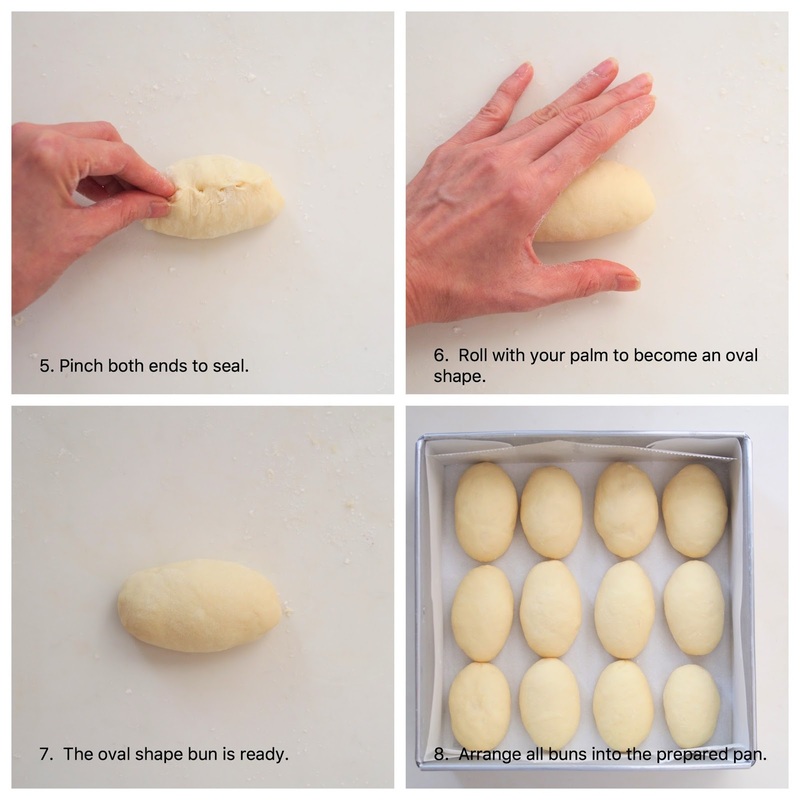 Flatten the dough and shape it into an oval shape. 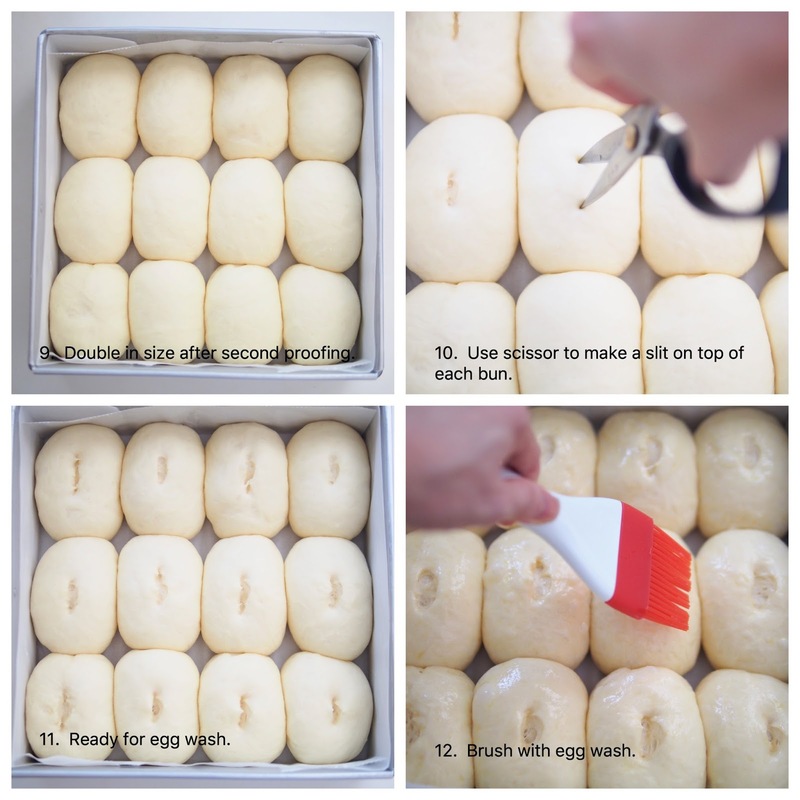 Place the buns in the prepared baking pan. Let it rise for another 50 minutes or until double in size. Slit centre of the bun with scissor. Brush with egg wash. Place the butter cube onto the slit and top with sea salt and brown sugar. Coarse sugar is better for topping as it has larger crystals compare with regular sugar and makes it more resistant to heat. Thank you for your comment. Sorry, I forgot to mention the pan size used. It's 10 inch square pan. Thank you for your comment and dropping by. Please use this link to convert. Thank you for trying this recipe. I am happy to hear that you like it. May I ask for your Pinterest link? May I know the estimated weight of each shaped dough? Thanks for asking and dropping by. Sorry, I forgot the weight. Please weigh the total dough and divide by 12. Thank you for your question. Yes, you can omit the egg. But, please increase the fresh milk quantity. Maybe to 30 to 40g or more. Please adjust accordingly. Hi Reena, Thank you for asking. 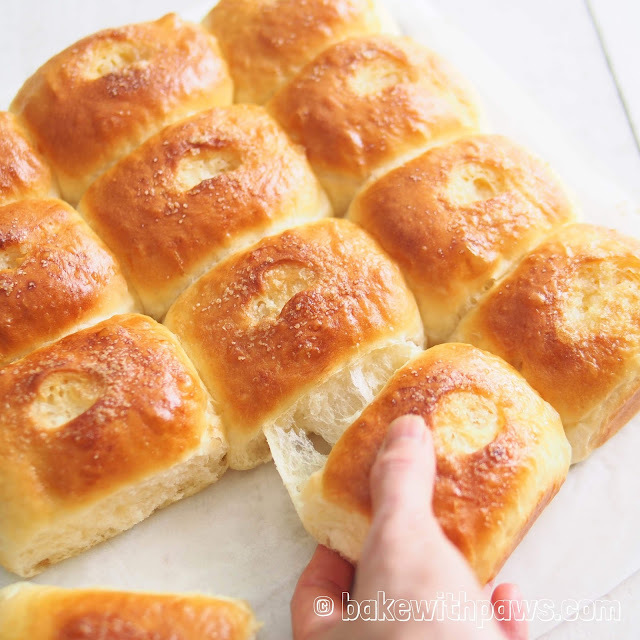 Tangzhong (Water Roux) is a Japanese technique cooks a small percentage of the flour and liquid (water or milk) and adding to your yeast bread mixture, which make your bread texture soft and moist. The method is shared on the above post. You may also search online for Tangzhong or water roux for more information. Thank you for asking and interest in this recipe. However, I do not how to convert from grams to cups as I never used cups measurement in my recipe. I afraid I may give you the wrong measurement. 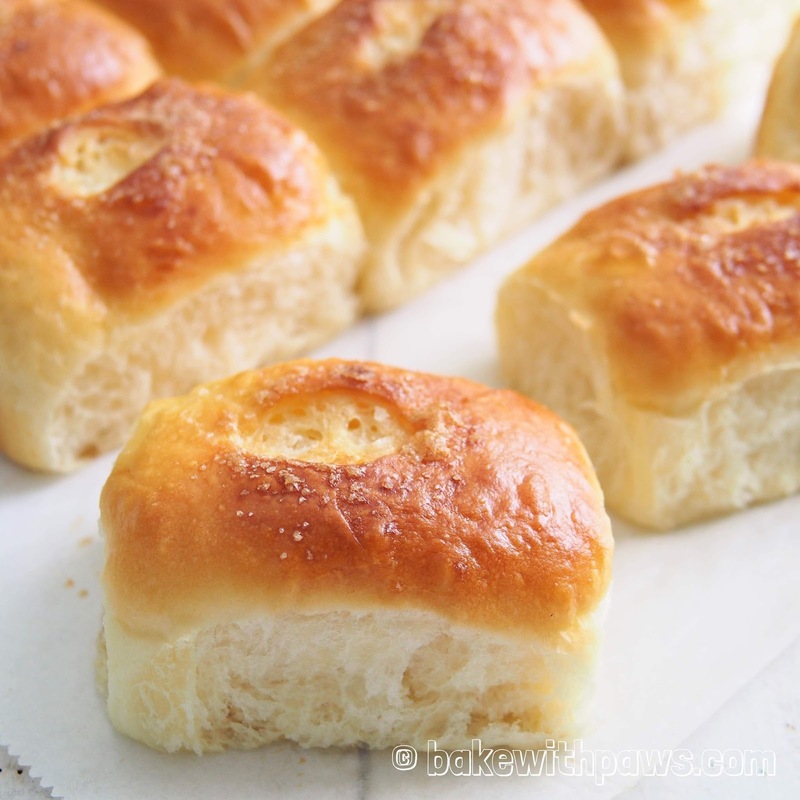 Could I use the breadmaker to prepare the dough as per your recipe? Yes, of course you can use breadmaker to knead the dough, shape and bake manually.